Naughty! Naughty! Naughty! (m. Nat Vincent, w. Joe Goodwin & William Tracey) was introduced in a revue called The Show of Wonders, a J.J. Shubert production with book by Harold Atteridge; music by Sigmund Romberg, Otto Motzan and Herman Timberg; and lyrics by Harold Atteridge. It opened 26 Oct 1916 at the Winter Garden Theater and closed after 209 performances on 21 Apr 1917 . 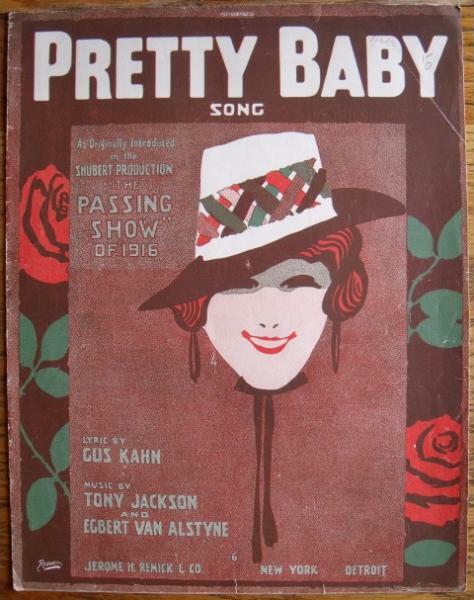 Note that the sheet music cover at right credits a fourth writer, Claude McKay. A song published in 1911, with music by Egbert van Alstyne and words by Harry Williams, has the same title, minus the exclamation points. Brian Holland performing Top Liner Rag at the 2008 Templeton Ragtime and Jazz Festival. Above: Members of the cast of The Century Girl (1916) in costume for the Irving Berlin number “Alice in Wonderland.” The Complete Lyrics of Irving Berlin , p. 149, names some of the cards: Lilyan Tashman (King of Hearts), Marion Fairbanks (Jack of Diamonds), and Madeleine Fairbanks (Jack of Clubs). (above, right) Ida Adams and chorus performing Oh! How She Could Yacki Hacki Wicki Wacki Woo in the Edwardian musical comedy, Houp La! (photo: Foulsham & Banfield, London, 1916) — Thanks to Footlight Notes (linked corrected, 9 July 2018) for the photo and information. There was a wonderful American woman named Ida Adams in the cast. She was spectacular! They used to keep some staff on at the bank every night, so that she could put all her jewellery back after the show. Oh, she was glorious!